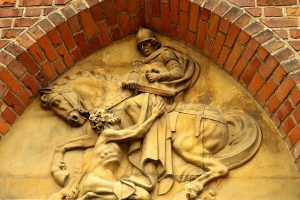 In today’s post I want to share with you the story of Saint Martin or Sankt Martin as we say in German. Why? 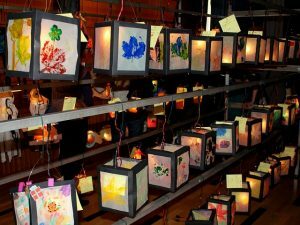 Because on November the 11th all primary school children in Germany celebrate Saint Martin’s day in a procession with handmade lanterns. This is a very important date in the German school calendar. So who was Saint Martin? Saint Martin was the third Bishop of Tours and a Roman by birth. And unlike many other saints he was not a martyr, but was made a saint because he was seen as a hero. It’s not known when exactly he was born but it’s believed to be in 316/17 in Savaria – which was in the Roman province Pannonia prima and is now Szombathely in Hungary. He died on the 8th of November in 397 in Candes near Tours in France. Martin’s father was a military tribune and Martin was expected to enter the military – against his own will. Martin was a very devout man and his Christian belief deepened in the course of his military career which lasted 25 years. After his time in the military he got baptised and moved to the island of Gallinara by Genua, where he wanted to spend time on his own, however that plan didn’t work out for him as his disciples followed him. He then travelled to his mum in Pannonia and converted her to Christianity. The next big step for him was building the first abbey of the Christian West – the Abbey de Ligugé. He also built the monastery Marmoutier near Tours. 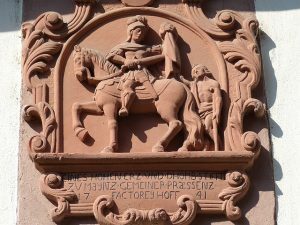 Saint Martin also spent a lot of his time in Trier. Martin was known to live a very ascetic life. However the incident he is most famous for and the reason for his sainthood happened while he was still a soldier serving as part of the Emperor’s guard in Amiens in the year 334. One winter’s day Martin met near the town’s gate a very poor, naked man who was clearly freezing. Martin had nothing on him apart from his own military clothes and a very generous two-part cloak. He split the cloak in half with his sword and gave the poor man one half. In the following night he Jesus Christ appeared in his dream, dressed in the cloak half he had given to the poor man. Soon after, legends started describing Martin’s miracles. Some stories claim that he was able to wake the dead. Another legend tells of his appointment as the Bishop of Tours by the inhabitants of Tours in 371. Martin thought he was unworthy of this position and legend has it that he was hiding in a goose house. However the geese started to gabble and thus revealed his presence and Martin had to accept his position as Bishop. The custom of the Martin’s Goose stems from this legend. So why is Saint Martin’s day celebrated on the 11th of November and how? The Saint’s day of Saint Martin falls on the 11th not on the 8th which is the day he died, because he was buried on the 11th of November in 397. Saint Martin’s day is celebrated in a lot of Christian countries such as Belgium, Croatia, Malta, Denmark, Estonia and Germany. Here in Germany it’s a big event for primary school children. In the run up to Saint Martin’s day children create their own lanterns at school and on the 11th each school has their own procession in the evening. The children walk along with their lanterns and sing Martin songs. The walk normally starts at a church (or at the school) and goes to a public square. A rider dressed as Saint Martin is also part of the procession and once they arrive at the square a bonfire is lit and pretzels and sweets are shared out. In Cologne and other parts of the Rhineland there’s also the tradition that children go from house to house – or flat to flat- with their lanterns and sing in return for sweets. While the tradition of the lanterns is not quite clear it’s been thought of as a substitute for bonfires which symbolise light that holiness brings to the darkness and in Martin’s case hope to the poor. The Martin’s goose is another tradition and often served in restaurants as roasted goose with red cabbage and dumplings. Another nice tradition is the “Martinshörnchen” a pastry formed into a croissant . You can find the recipe for this here. I honestly can’t remember if I have ever had Martinshörnchen, but I definitely remember and loved eating Weckmänner (also known as Stutenkerle) which are very common in Cologne on Martin’s day. Made with a yeast dough, these pastries are shaped like a man and have a clay pipe attached to them. They are really yummy. I really like the Saint Martin’s day tradition. It’s great for the children as they get to create something really special, learn about the Saint himself and the importance of sharing with the less fortunate. And they get to sing. It also brings some light into the darkening days of November. Unfortunately the tradition is only reserved for the primary school kids, once you go to secondary school you are deemed too old for this. I hope you found this post interesting – feel free to comment below and share.